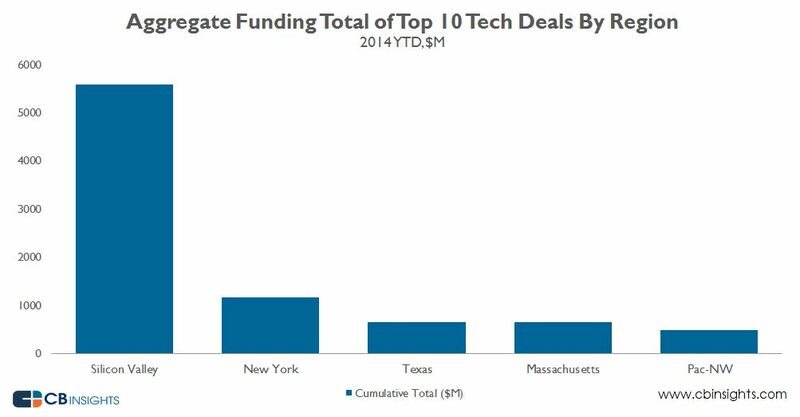 CB Insights: How do Silicon Valley, New York, Massachusetts, Texas and Pac-NW’s 10 Largest Tech Financings of 2014 Stack Up? Want access to The 2015 Tech IPO Pipeline report? In Silicon Valley, the 10 largest financing deals to venture-backed companies in 2014 raised a whopping $5.57B in funding. Uber took the largest two deals at $1.2B each. Cloudera, AirBnB and Palantir rounded out the top 5 – having each raised over $400M in 2014. Of note, the smallest of the top 10 deals, flash storage company Pure Storage’s Series F, still clocked in at $225M. New York’s biggest deal to a venture-backed company in 2014 actually went to a real estate firm, co-working space WeWork, which took a $355M investment at a $5B valuation. Within the tech sector, Vice Media secured the two largest deals at $250M each, followed by Google Ventures-backed Flatiron Health at $130M. Mark Lore, the founder of Diapers.com, saw his stealthy startup Jet.com, which raised $55M in Series A funding and $25M in debt and credit from Western Technology Investment and Silicon Valley Bank just miss the list. OnDeck which ultimately IPO’d went onto be NY’s largest venture-backed exit ever. Wayfair, which went public earlier this and now carries a market cap of $1.73B, took the largest funding of any VC-backed Mass. tech company in 2014, at $157M. The top 10 deals leaned heavy on the enterprise tech side with companies including ActiFio, Applause and Acquia. Total funding by the top 10 Mass. tech deals reached $646M. Austin-based payments firm Mozido’s $185M Series B was the largest tech round of the year in the Lone Star State. The $185M came in addition to an $80M financing the company closed in May. Other top Texas deals in 2014 included IoT company Phunware, social media management firm Spredfast and geospatial data company Surveying and Mapping, which raised a total of $159M this year. Total funding by the top 10 Texas tech deals reached $653M. Fin Tech firm Avalara $100M round in November topped the list of Washington tech deals in 2014. After the acquisition of Trulia by Zillow, Redfin bulked up with $70.9M in funding from investors including Tiger Global Management, T. Rowe Price and Glynn Capital Management to take the second largest tech round in the Pac-NW. The 10 largest Pac-NW tech deals took $486M in aggregate funding, the smallest total of the five hubs.